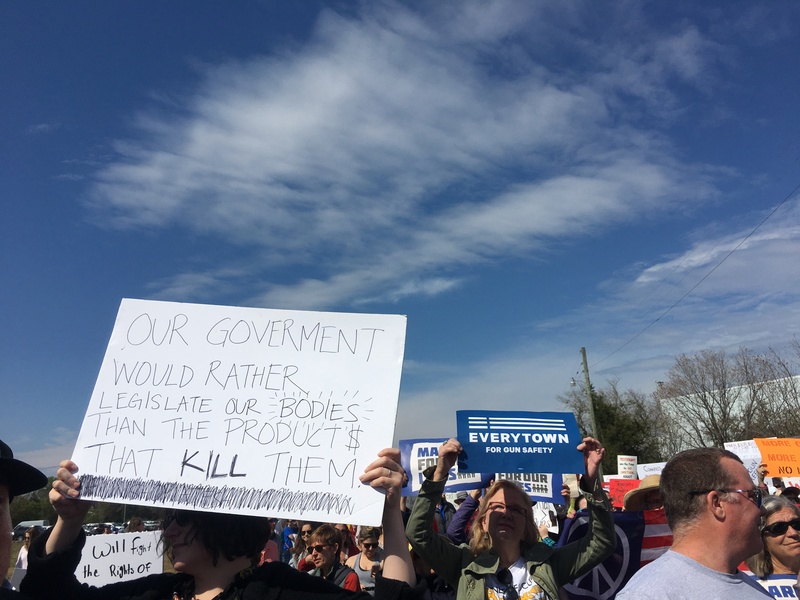 Signs and chants across the country echoed this ideology on March 24, as hundreds of thousands came together to mourn gun violence deaths and bring gun reform to the forefront of the political atmosphere. 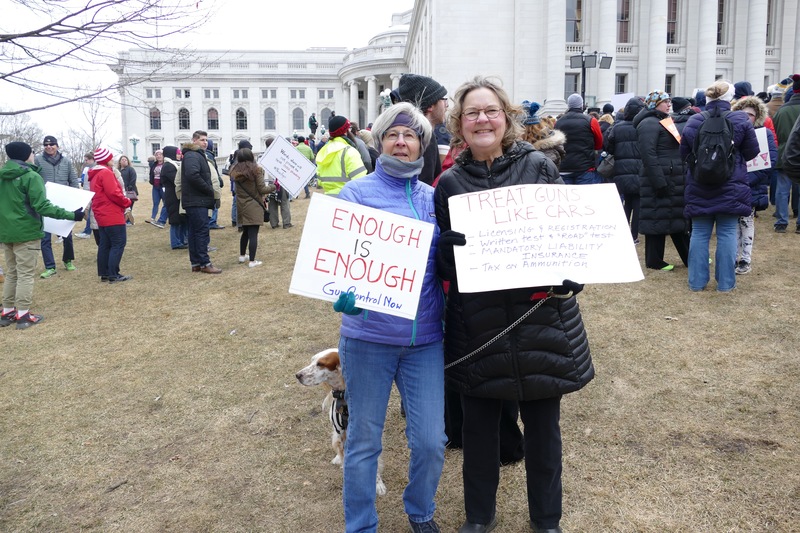 The day of the March for Our Lives protests was filled with emotion and calls for action, with people ranging from students to retired citizens coming together for the event. 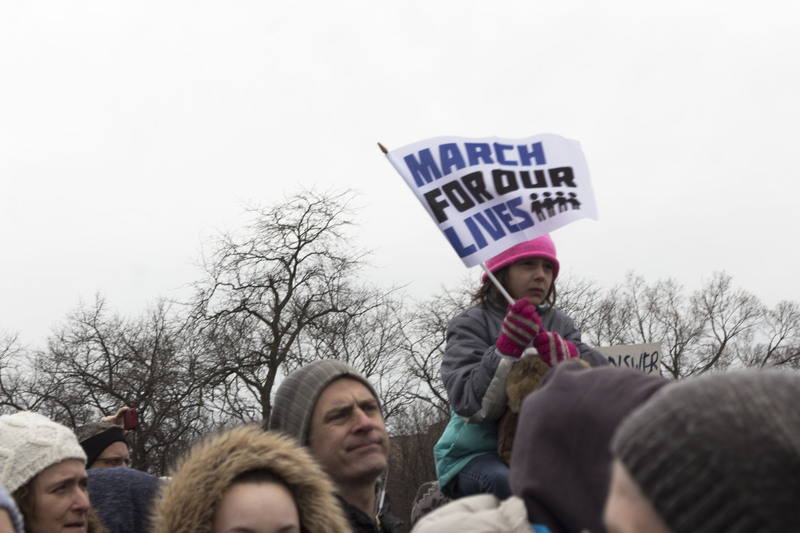 Taking to the streets, parks, state capitols and event spaces, marchers came to protest the current gun laws in America after Nikolas Cruz took a semi-automatic rifle and killed 17 people at his former Florida school, Stoneman Douglas High School, in February. Emma Gonzalez, a survivor of the Parkland shooting and one of the students who pushed for March for Our Lives, made a powerful speech at the Washington D.C. event that drew large numbers of people to the nation’s capital. 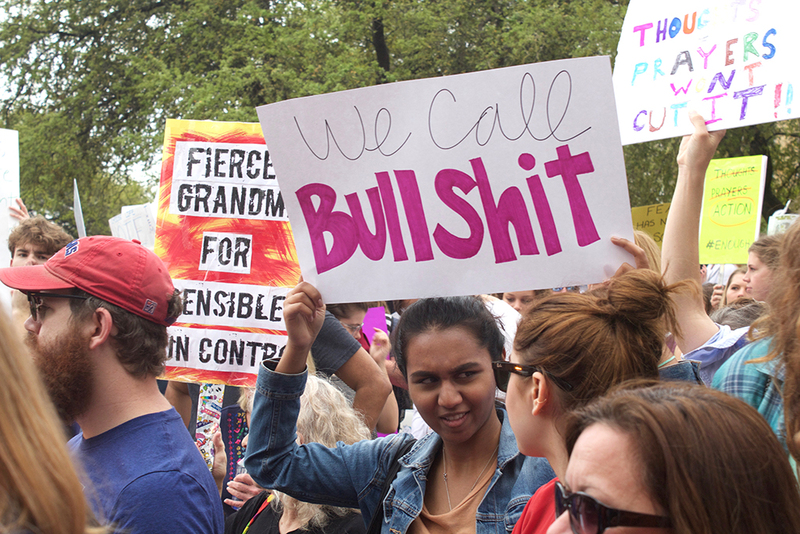 The number has been highly debated, with Digital Design and Imaging Service Inc. said there were about 200,000 protesters while organizers said it was closer to 800,000. 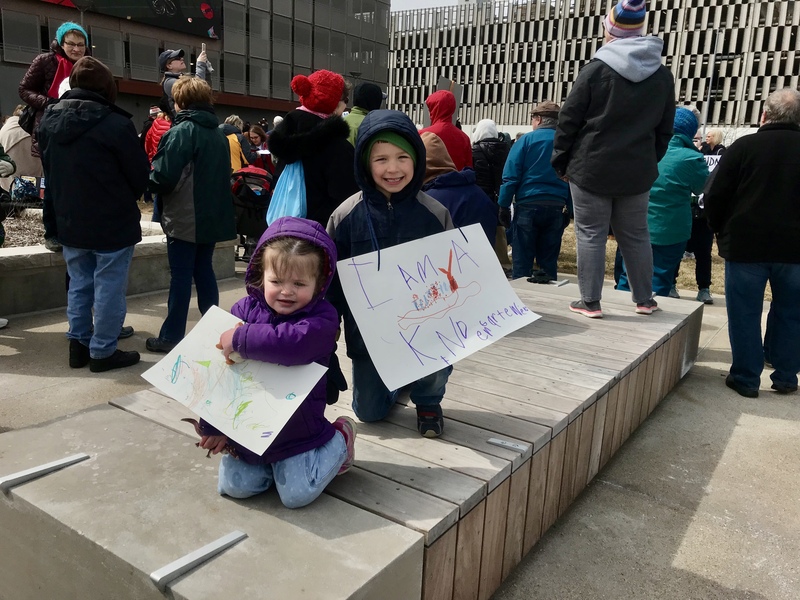 In all, there were over 800 sibling marches in the U.S., while other events took place in places like France and Chile to show support for March for Our Lives. 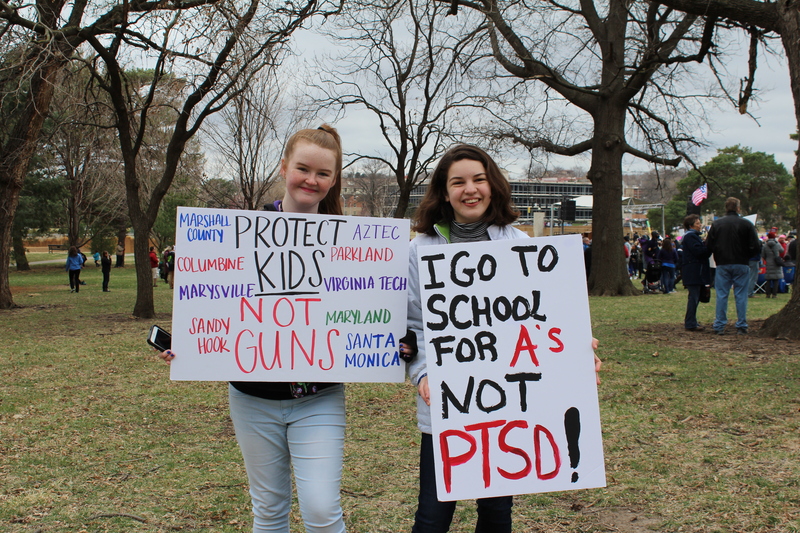 Though most of the march was in response to the Parkland, Florida shooting and was largely inspired by a few of the surviving students who have put themselves in the middle of the debate, their high school is far from the first school shooting to happen in 2018. 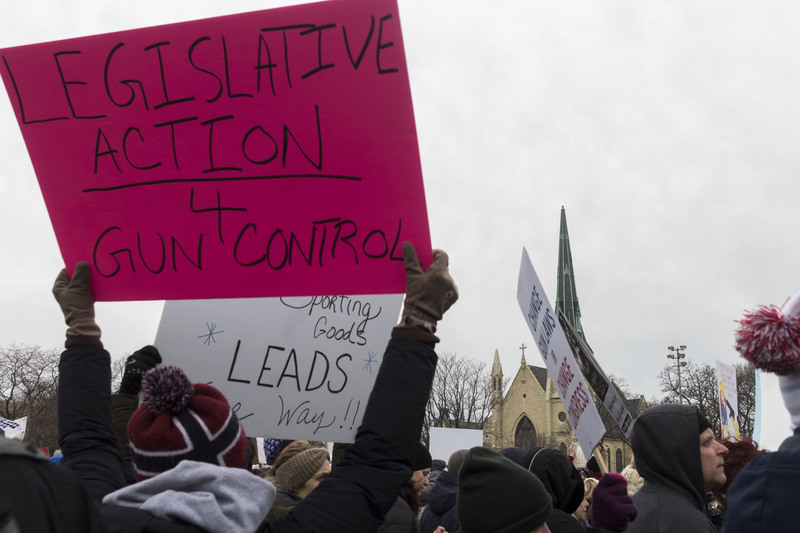 According to gun law advocacy group Everytown for Gun Safety, there have already been 33 shootings on school property in nearly four months this year. 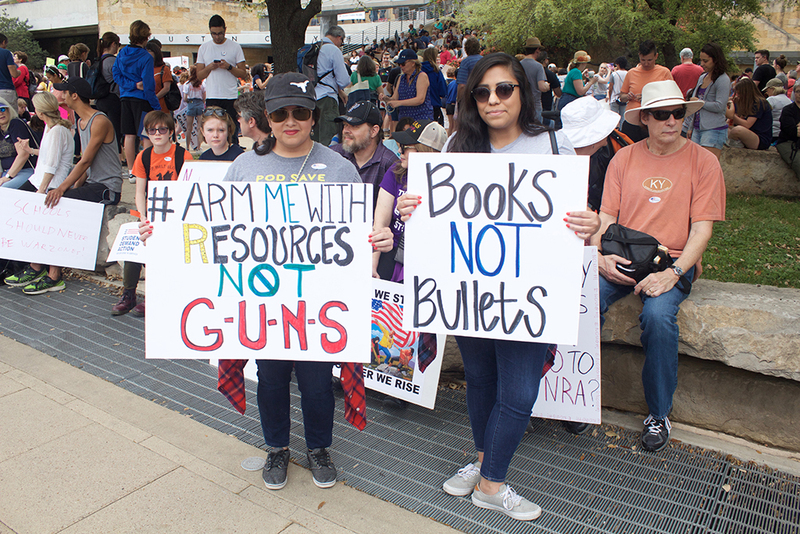 Many protesters came ready to oppose the high amount of school shootings that have occurred followed by little to no action from political leaders. 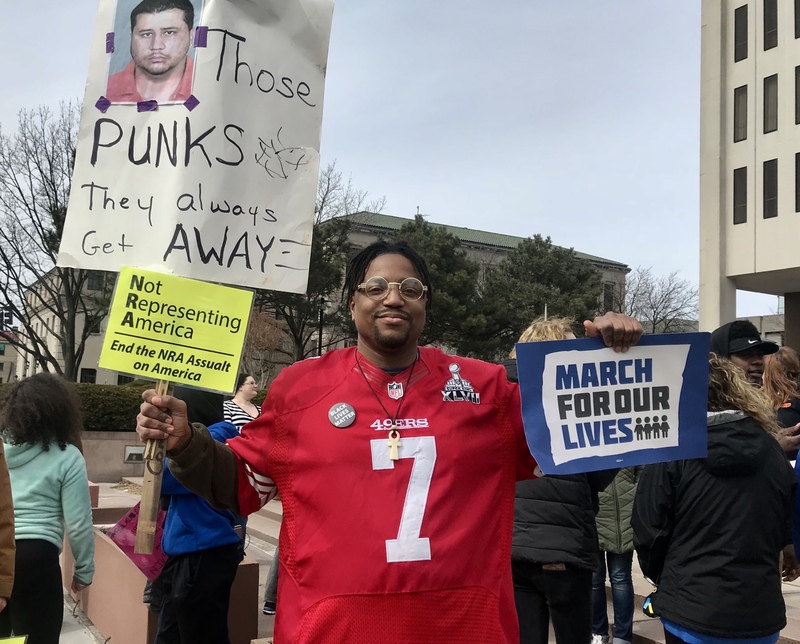 Many came in protest of their own individual run-ins with gun violence, or to denounce prominent groups like the National Rifle Association (NRA). 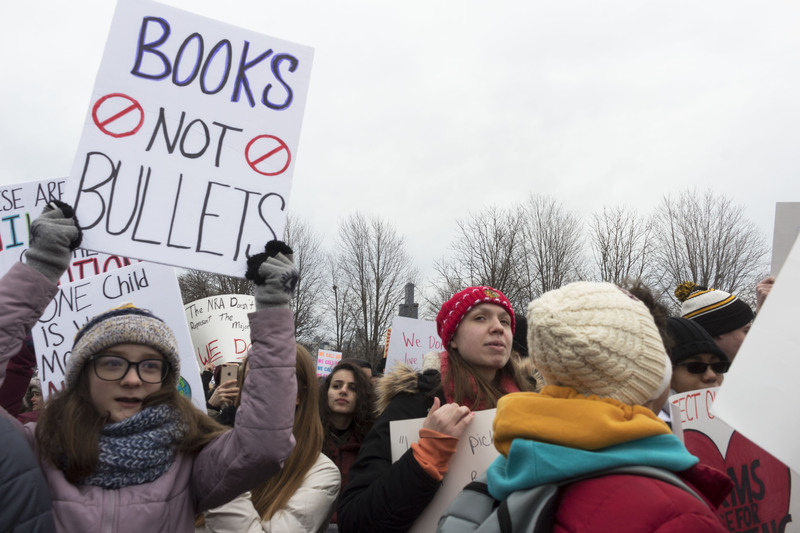 Others were teachers, who asked for books and pencils to be given to them rather than guns, like controversial laws about arming teachers so they can protect their classes that were proposed after the Florida shooting. 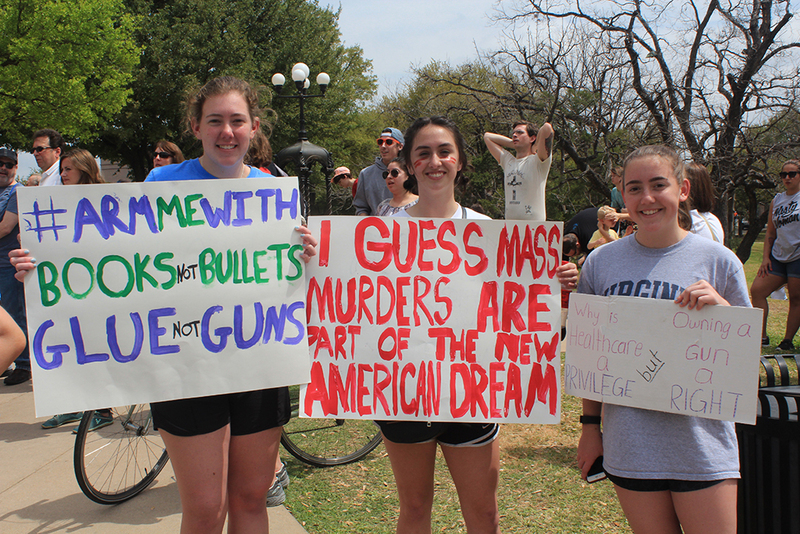 A majority of protesters and organizers of the events, though, were high school students who were tired of the threat of gun violence when they go to school. 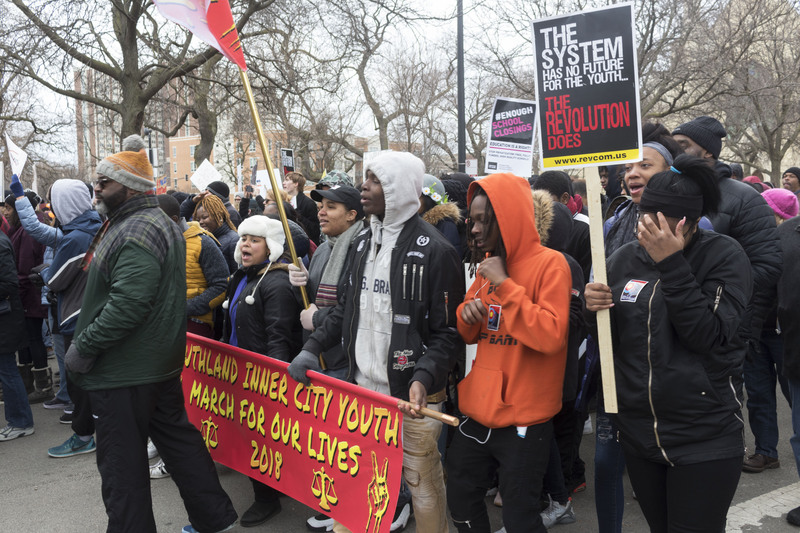 DePaul students were able to join the D.C. march for free through Metro Chicago Hillel, an organization that provides a community for Jewish college students in Chicago, which sent two buses and nearly 100 students to the largest March for Our Lives event. 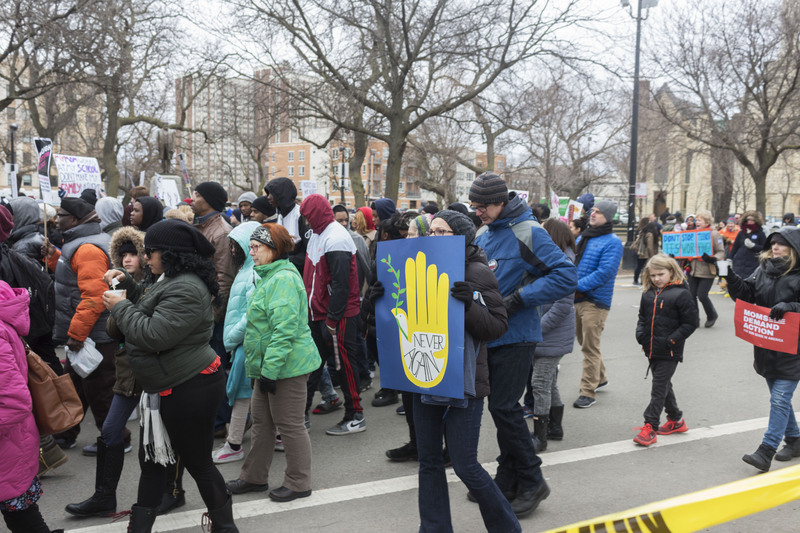 Metro Chicago Hillel chose to send students to the event to protest for their beliefs and to “speak out against violence and also advocate for common-sense solutions to stop these massacres from occurring,” according to their trip’s resource guide. 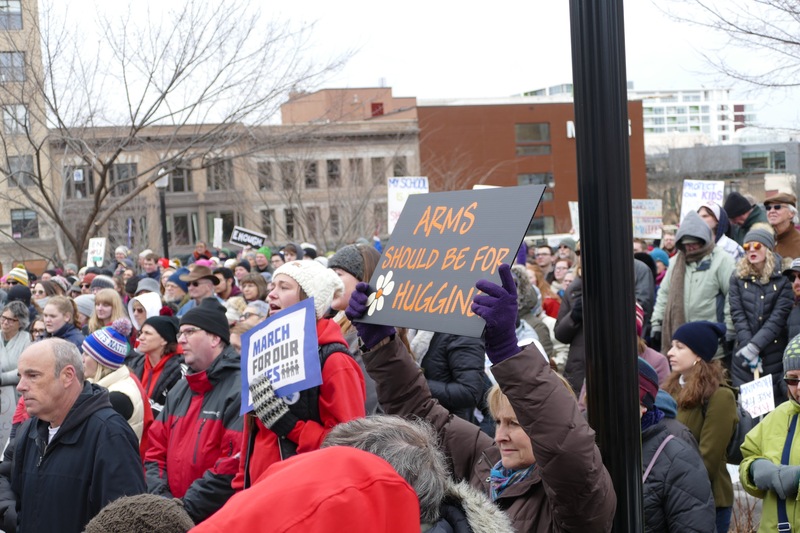 Each event was filled with chants, marches and speakers all aimed at advocating for gun reform. 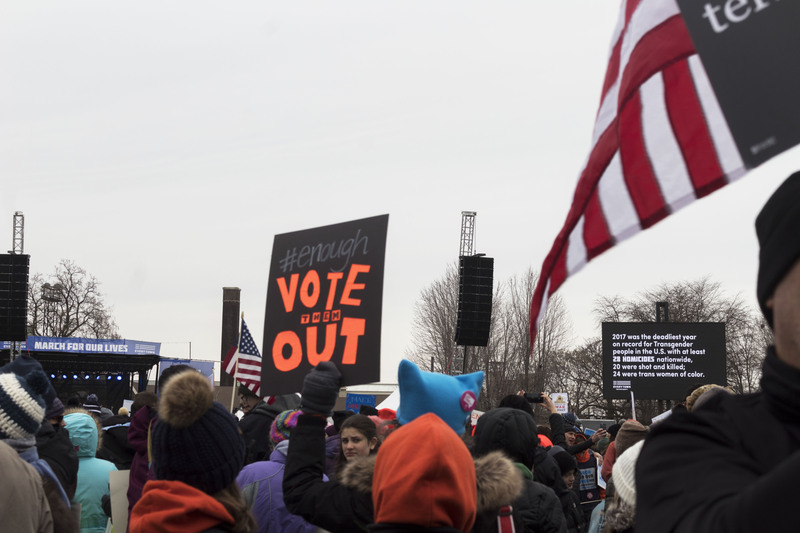 Organizations spoke on stages across the nation to declare their mission and ask people to join them, politicians made pledges to impose harsher gun laws during their time in office. 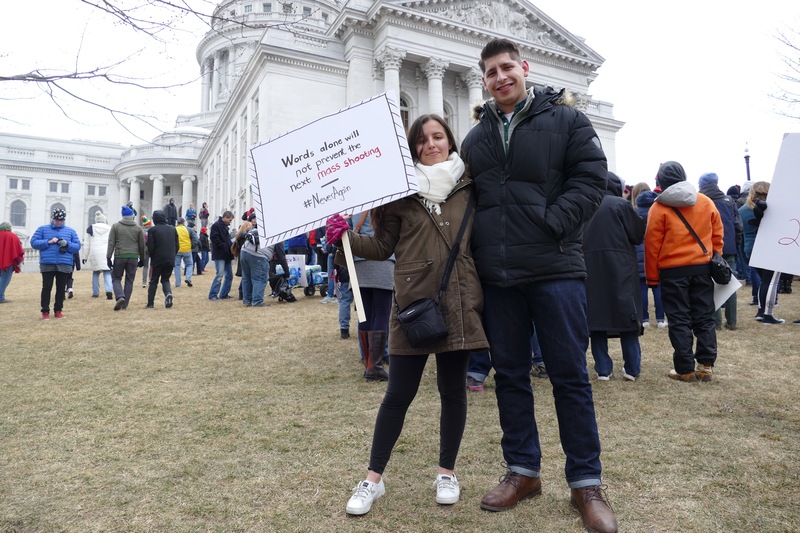 High school students also took the stage and pleaded with older generations to vote for lawmakers who would follow through on promises that were made that day because they weren’t old enough to ask. 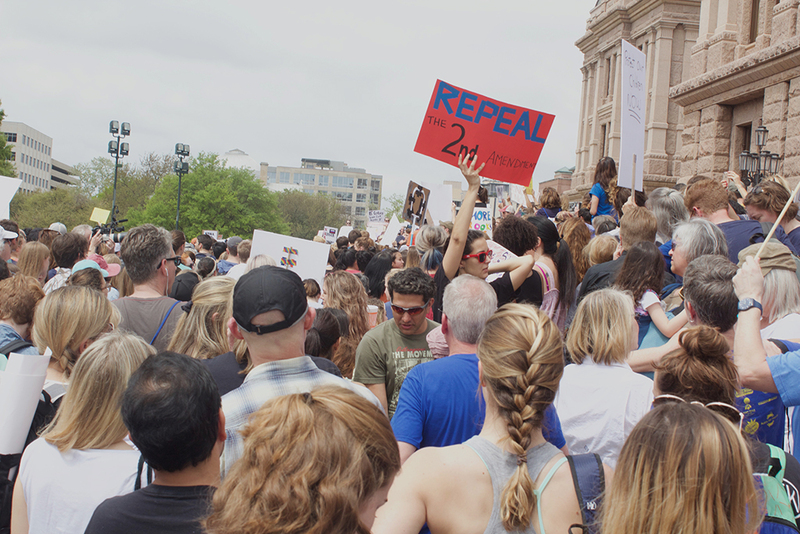 14 East editors and reporters went to different events around the country and had people share why they chose to join in the march. Photo: Madeline Happold, 14 East. 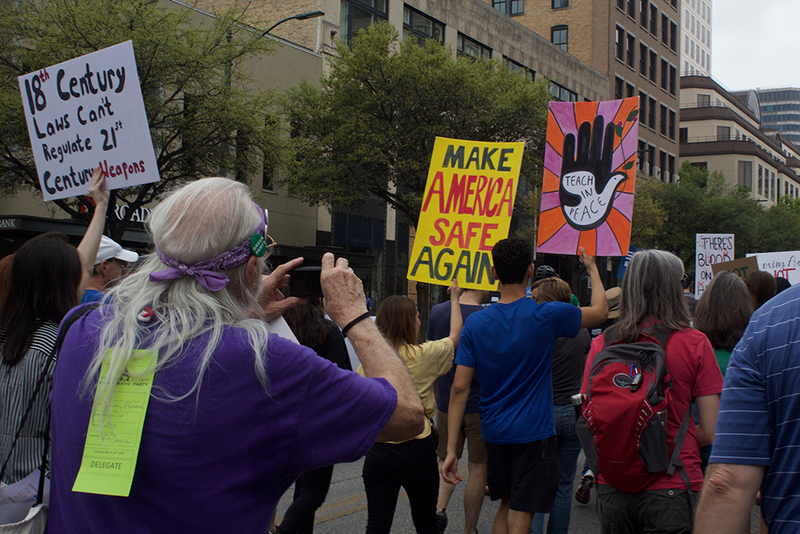 On the sidewalk where the March would officially start, colored signs with portraits of each victim from the Parkland, Florida shooting lined each side, being a stark reminder of the reason why the March had formed in the first place. Photo: Carina Smith, 14 East. 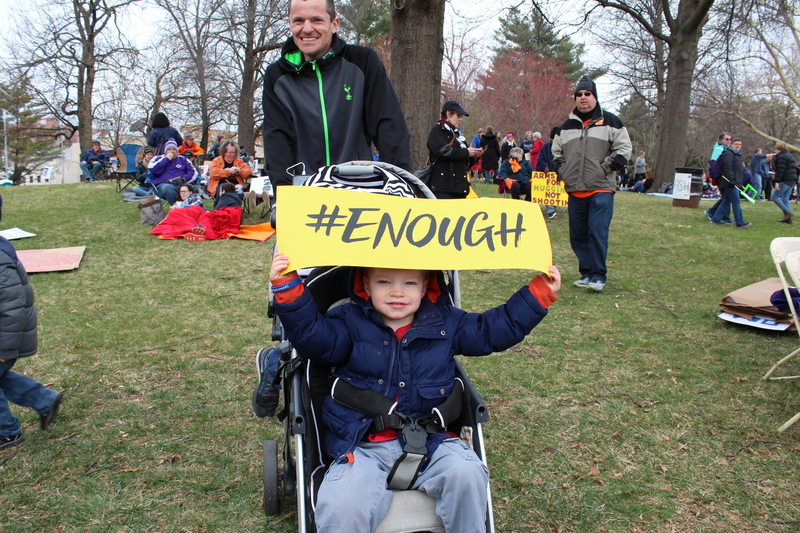 Daniel, strapped in his stroller, held a sign with the popular hashtag that came up after the Parkland, Florida shooting. 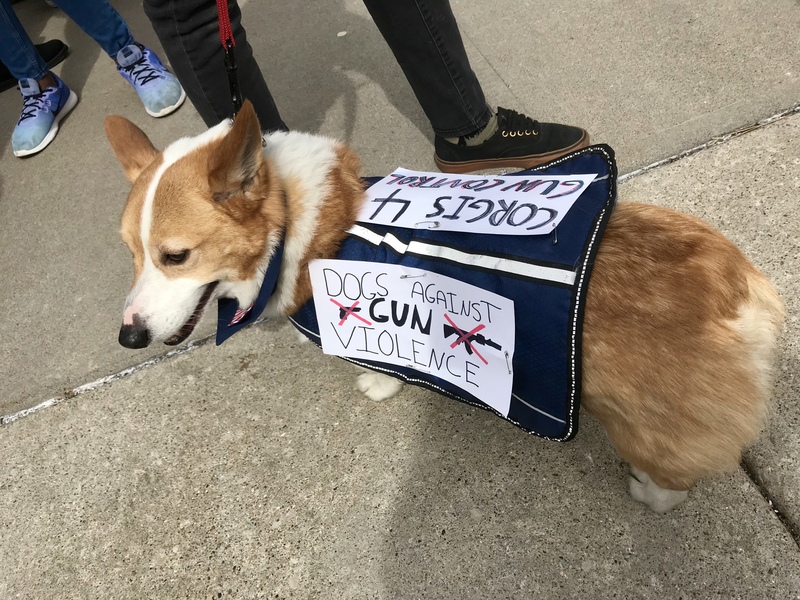 His father, who was tasked with pushing him around in his stroller, said Daniel had grabbed the sign from a table that was set up by organizers of March for Our Lives Kansas City. Photo: Carina Smith, 14 East. 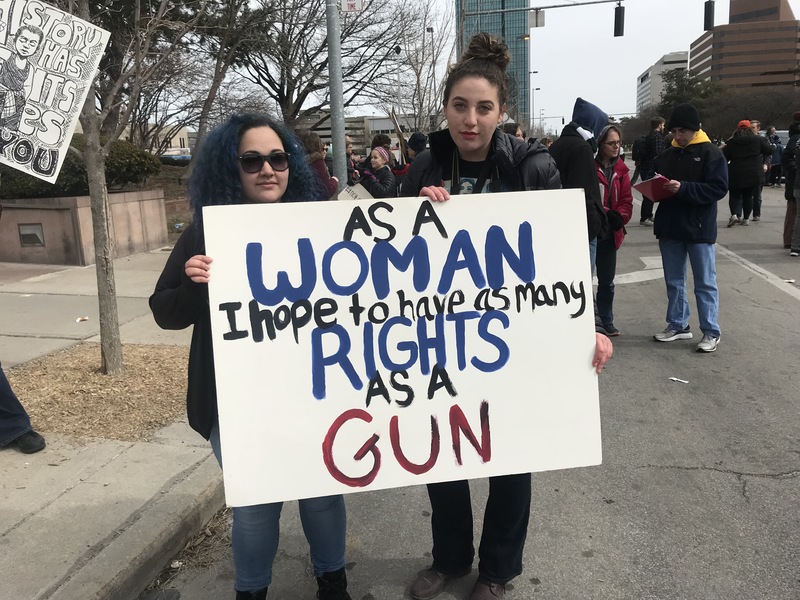 Two high school students, Claire and Gabriella, drove hours to be at the march in Kansas City. 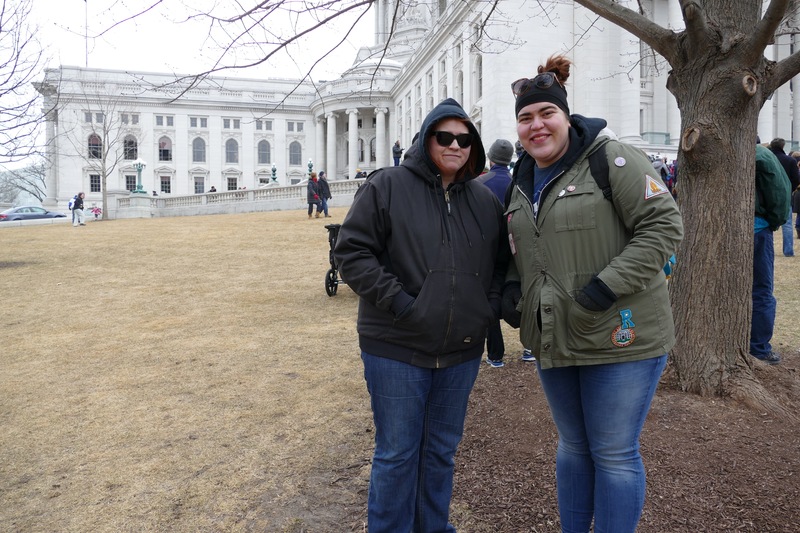 Many local high school students had taken initiative to put together the event, and the two wanted to be a part of the historic moment. 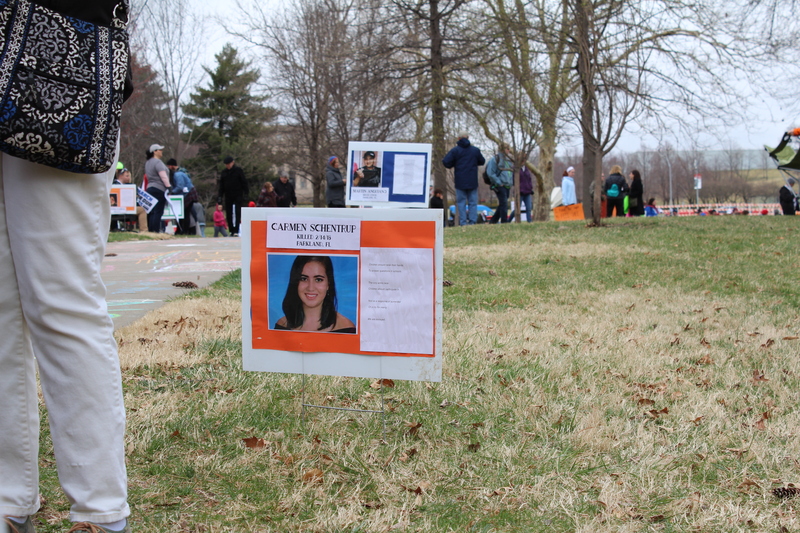 “I just think the (Shawnee Mission) East kids are fantastic for even wanting to put it together,” Gabrielle said. Photo: Carina Smith, 14 East. 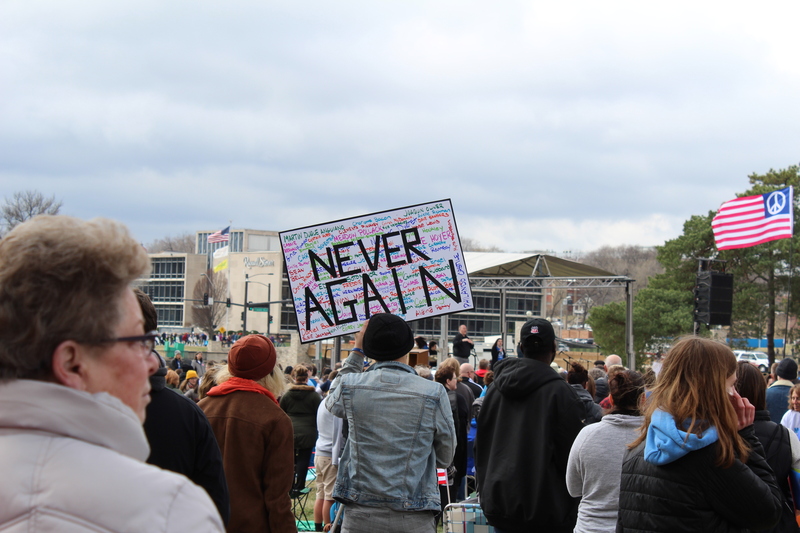 A protester holds up a large sign during speaker presentations that includes the names of victims in multiple colors, with the contrast of black letters to say “Never Again.” The protester held the sign up while the crowd chanted “never again, never again,” after a speaker held a roll call for all those who had died in the Parkland, Florida shootings. Photo: Carina Smith, 14 East. 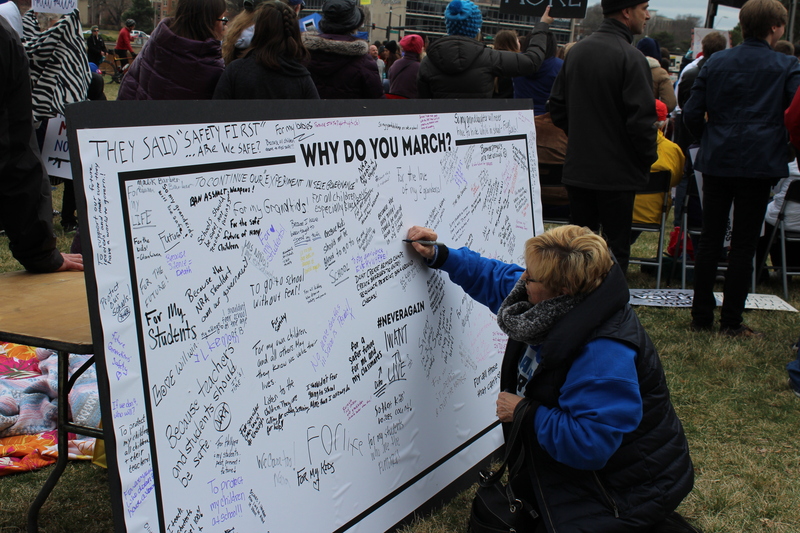 Kneeling down on the grass reading fellow marchers’ reasons to be at the March for Our Lives, a woman grabs a Sharpie and explains why she is there -- “For all the helpless kids.” Photo: Carina Smith, 14 East. 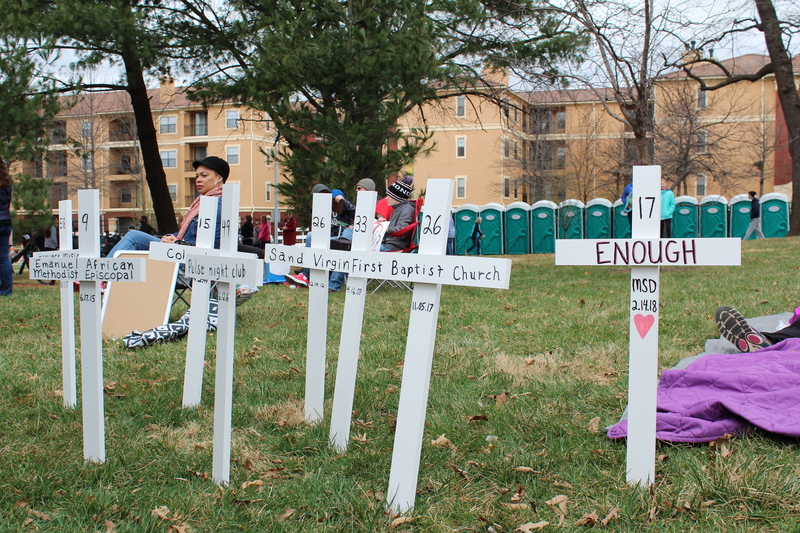 White crosses stick out on the outskirts of the protest in Kansas City, Missouri. 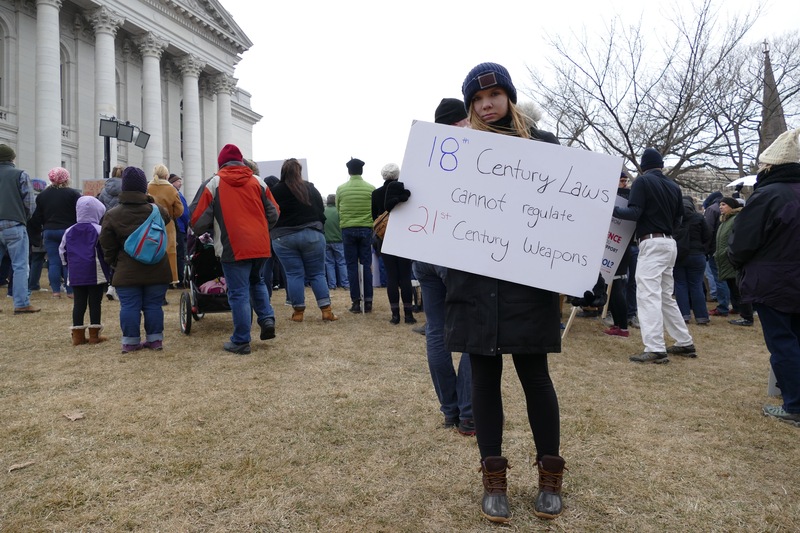 Each one symbolized some of the worst mass shootings that have happened in U.S. history, such as Columbine and Pulse nightclub. The dates of each shooting were written directly beneath each shooting, and many protesters stood to stare at the crosses in silence. Photo: Carina Smith, 14 East. “I think that guns are deadly weapons and they should be treated as such. I don’t think we’ll every eliminate all guns in this country but I think we should treat them like cars and every gun owner has to have liability insurance. You get hit by a car you have some recourse, you get shot by a gun you get dead. I am a former teacher and I’ve been through all of the drills and I’ve been in a situation with an active shooter and it's insane that our children have to go through this. It’s insane to think about arming teachers. We’ve got enough to do. 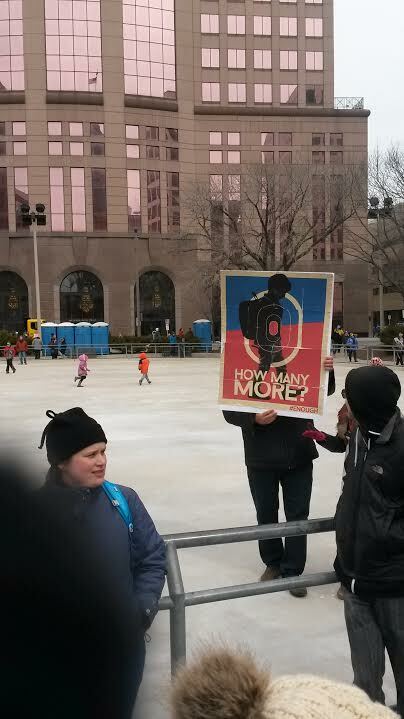 We have more than enough to do. So somebody has got to help protect these kids. 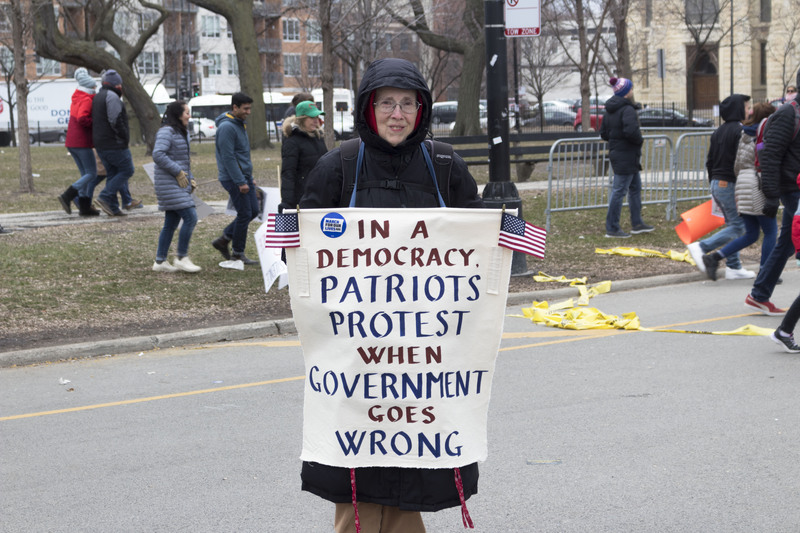 If the politicians won’t well the people have to speak up because this is not right,” Patty Werner. Photo: Marissa Nelson, 14 East. 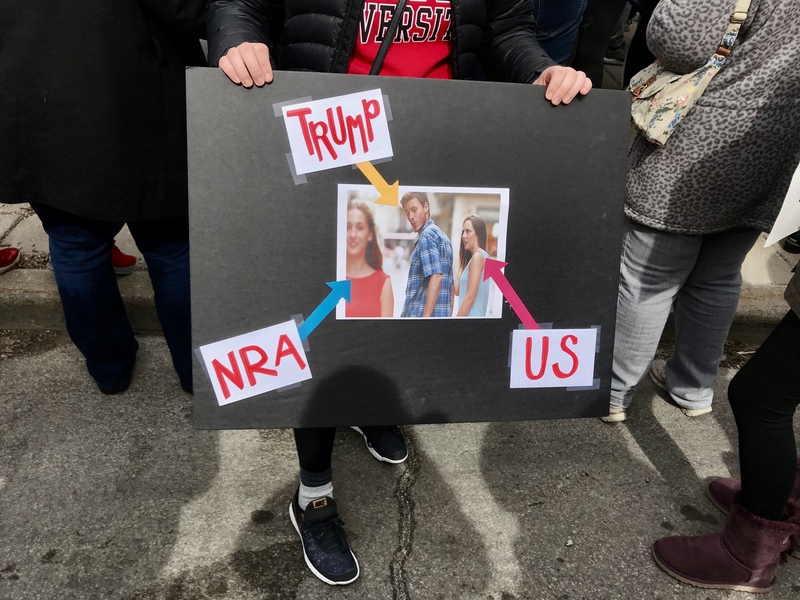 “I am marching today because it is absolutely absurd that the third highest cause of death in our children is gun violence. I am a gun owner and a gun advocate but there needs to be reform. We can have both. It strikes me as odd that all you need is a valid ID to get a gun. When you turn 16 they don’t hand you the keys to a car and say good luck there needs to be education about guns to prevent accidental gun violence. There’s a lot of suicide that happens on accident because you know kids get ahold of guns or people don’t know how to store them and we just need gun education. We don’t need to take them away but there’s also no reason that anyone would need to own an AR-15 unless it was for murder" Bobbi Schmidt. Photo: Marissa Nelson, 14 East. “No one should be afraid to go to school. Period. Whether you’re in college, whether you’re in elementary school, middle school, high school. Parents shouldn’t be afraid to send their kids to school. Especially if it is a public school. These are tragedies and they can be avoided and something needs to be done," Israel Lopez. Photo: Marissa Nelson. 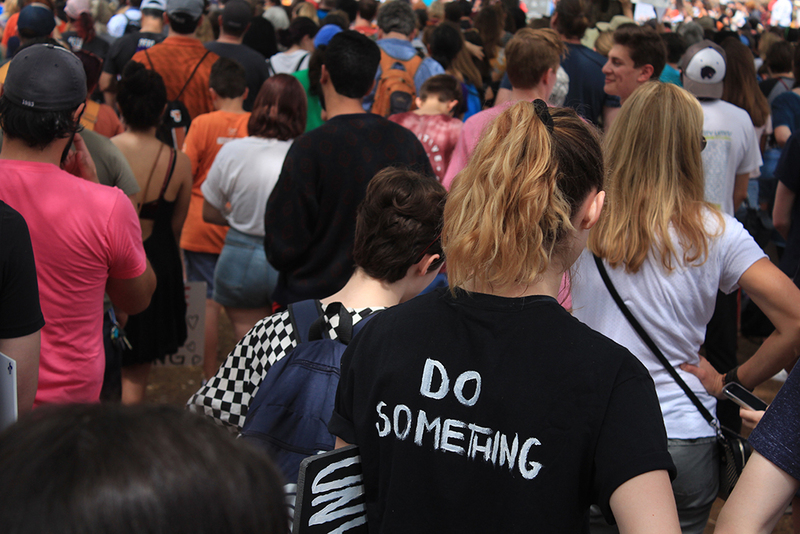 “I just want to tell everybody that we are the generation that makes a change and we are the generation that needs to stand up and fight for what we believe in and we need to make change in the government now," Claire Veidel. Photo: Marissa Nelson, 14 East. Photo: Marissa Nelson, 14 East. Photo: Kathleen Fatica, 14 East. Photo: Jenni Holtz, 14 East. Photo: Meredith Melland, 14 East. Photo: Francesca Mathewes, 14 East. Header photo by Madeline Happold.